*Present address: Royal Radar Establishment, Great Malvern, Worcestershire, England. The diffraction loss and beam size of the TEM00 mode in gas lasers have been determined experimentally. The results are in agreement with theoretically predicted values to within the experimental error, except that the increase in beam size with reduction of mirror size was found to be less than predicted. 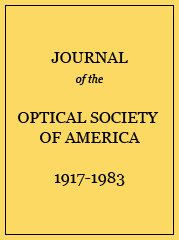 Laser beam diameters compared with nonconfocal theory.